This image of supernova remnant G54.1+0.3 includes radio, infrared and X-ray light. 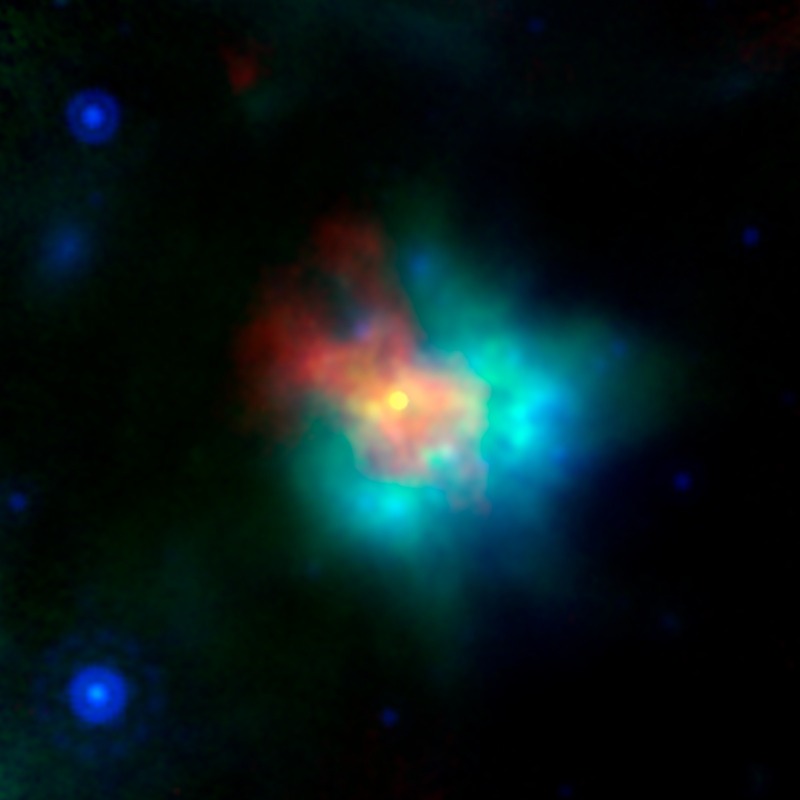 The saturated yellow point at the center of the image indicates strong X-ray source at the center of the supernova remnant. This is an incredibly dense object called a neutron star, which can form as a star runs out of fuel to keep it inflated, and the unsupported material collapses down on to the star's core. G54.1+0.3 contains a special type of neutron star called a pulsar, which emits particularly bright radio and X-ray emissions. The blue and green emissions show the presence of dust, including silica. The red hues correspond to radio data from the Karl G. Jansky Very Large Array; green corresponds to 70 m wavelength infrared light from the European Space Agency's Herschel Space Observatory; blue corresponds to 24 m wavelength infrared light from the Multiband Imaging Photometer (MIPS) instrument on NASA's Spitzer Space Telescope; yellow corresponds to X-ray data from the Chandra X-ray Observatory.